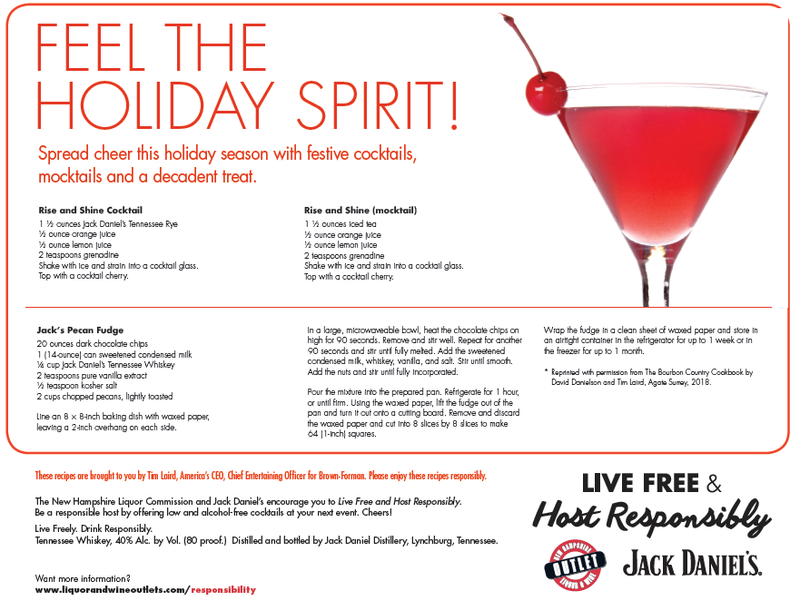 Live Free & Host Responsibly is now featuring downloadable tips and festive recipes, including a “Rise and Shine” cocktail made with Jack Daniel’s Tennessee Rye, orange juice and lemon juice, and an alcohol-free version of the Rise and Shine, which features iced tea instead of whiskey. The webpage also features a recipe for “Jack’s Pecan Fudge,” to cure your sweet tooth this holiday season. NHLC and Jack Daniel’s initially teamed up for the Live Free & Host Responsibly campaign in 2015, marking the first time a control state had partnered with a fine wine and spirits company on a responsibility initiative. NHLC, which is considered the most profitable and progressive control state, and Jack Daniel’s, one of the most respected and recognized brands in the world, launched this strategic effort to serve as a resource for hosts and servers. The Live Free & Host Responsibly webpage features an instructional video demonstrating how to prepare holiday food and drink recipes developed by Tim Laird, America’s Chief Entertaining Officer. Laird is an authority on wines and spirits with more than 20 years of experience in the hospitality industry. A connoisseur of fine wines, spirits and champagnes, Laird is also a gourmet chef and master at entertaining. Laird makes hundreds of appearances each year on radio and television programs and has appeared on The Today Show, The CBS Early Show, Fox & Friends, The Tonight Show, ABC World News Now, CNN, FOX News and CNBC networks. 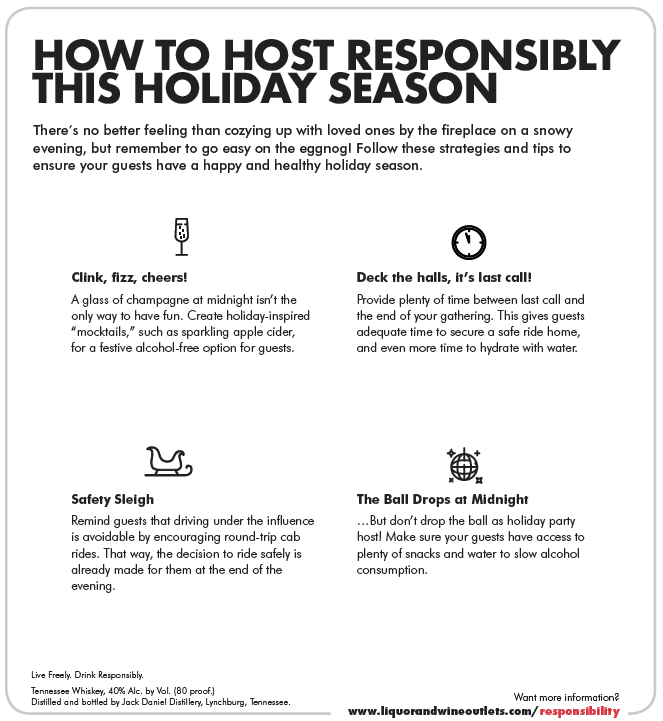 To access holiday hosting tips and recipes, and all Live Free & Host Responsibly resources, please visit NHLC’s responsibility web page at www.LiquorandWineOutlets.com/responsibility. The New Hampshire Liquor Commission (NHLC) operates 78 retail Outlets throughout the Granite State and serves more than 11 million customers each year. More than $3.6 billion in net profits has been raised since the first Outlet opened in 1934. NHLC set an all-time sales record in Fiscal Year 2018, generating $707.7 million in gross sales, an increase of $9.6 million over the previous fiscal year. Total liquor net profits reached $155.7 million, of which $148.9 million was transferred to the New Hampshire General Fund, which is used to fund programs including education, health and social services, transportation and natural resource protection. Additionally, $6.8 million was transferred to New Hampshire’s Alcohol Abuse Prevention and Treatment Fund, which utilizes a percentage of NHLC profits to fund addiction treatment and prevention programs. Visit www.LiquorandWineOutlets.com to locate an Outlet, search for product availability, learn about monthly sales, review wine tasting schedules, and sign up to receive significant savings with monthly Email Extras. Louisville, Kentucky-based Brown-Forman is a diversified producer of fine wine and spirits. The company was founded in 1870 by George Garvin Brown. His original brand, Old Forester Kentucky Straight Bourbon Whisky, was America's first bottled bourbon and remains one of Brown-Forman's finest brands today. One of the largest American-owned spirits and wine companies and among the top 10 largest global spirits companies, Brown-Forman sells its brands in more than 135 countries and has offices in cities across the globe. In all, Brown-Forman has more than 25 brands in its portfolio of wines and spirits.